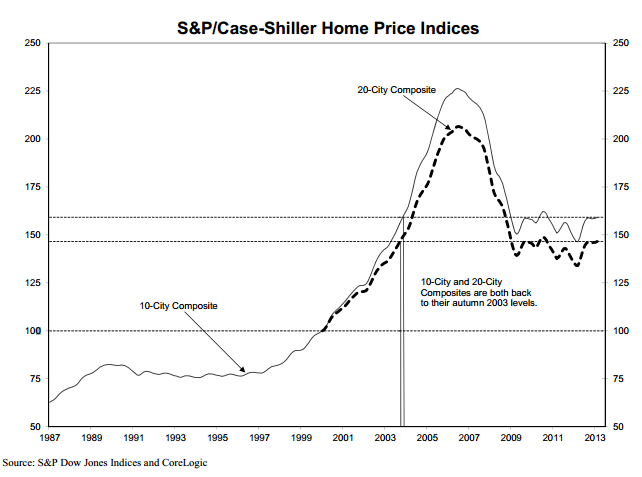 Tuesday’s report on the S&P/Case-Shiller home-price index showed a 9.3% increase between February 2012 and February 2013 — the biggest year-over-year increase in the 20-city composite index since before the housing bubble burst. Is housing, at long last, on the road to recovery? Many Americans already think so. A Pew Research survey in March found that 52% of people said their local home prices had risen over the past year, up from 25% the last time we asked the question in June 2011. In the most recent poll, seven out of 10 people said they expected home prices in their area to rise over the coming year and only 20% expected them to fall, versus 54% and 37%, respectively, in 2011. 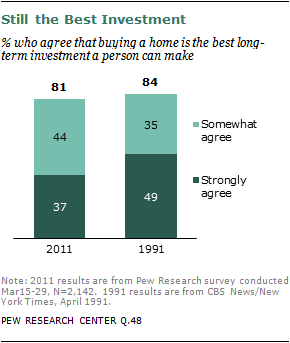 It takes a lot to dent Americans’ optimism about housing. Just over two years ago, when the housing bubble’s collapse was fresher in people’s minds, eight out of 10 people surveyed for a Pew Research report agreed that buying a home was the best long-term investment a person can make. Public perceptions of the housing market don’t always jibe with market measures such as Case-Shiller, which uses data on repeat sales (i.e., properties that have sold at least twice) in 20 major metropolitan areas to assess changes in home values. After peaking in July 2006, the Case-Shiller composite began to fall — modestly at first, then much more steeply starting in the summer of 2007. By April 2009, the index was nearly 33% off its peak. But as late as July 2008, 54% of Americans told Pew Research they still expected their local home prices to go up — even though an almost identical percentage said local prices had fallen over the past year, and the Case-Shiller appeared to be in free-fall. Though impressive, the big year-over-year gains in Tuesday’s report don’t necessarily signal a permanent housing recovery. The Case-Shiller composite has had several up-and-down cycles over the past four years, but has remained fairly range-bound: In fact, the index now stands almost exactly where it did in January 2009.